A South African find: the 2008 Spice Route "Chakalaka"
Why? A heady nose with aromas of dark berries and leather starts things off. Following hard on its heels is the full and rich mouthfeel, a little spicy and peppery but hard to pin down - it most definitely is not a dumbed-down 'internationalized' wine that tastes the same from any number of countries/regions. The reason likely has to do with where this wine hails from (Swartland in South Africa, where viticulture is still relatively young but rising fast) and its unusual blend of red varietals (51% Syrah, 16% Carignan, 11% Mourvedre, 11% Souzao (a Portuguese grape often used in dessert wines), 8% Grenache, 2% Tannat, and 1% Petite Syrah). The real reward comes, however, when you sample this wine with a dish with a similarly long list of spices. I paired it with a Malaysian Fish Curry, and the richness of the coconut milk, turmeric and other spices was a perfect foil for the robust character of the Chakalaka. I'd imagine it would go equally well with Latin-inspired flavors as well as Asian ones, and that's what I'm going to try next. Grade: B+ (and an A for value at $8 a bottle). In a pinch it can be a 'swirl by the fire' wine, but its characteristics work better in combination with well-spiced food. The Austrian Wine Marketing Board and the Austrian Trade Commission are hosting an event in San Francisco on May 3 that is sure to be a good time. The event is called "Austria Uncorked" and features more than 80 Austrian winemakers (along with Austrian cheeses to cleanse your palate ...). Austrian wine has long been a favorite of mine; in-the-know restaurant wine lists always slip in a few bottles with unpronounceable names (blaufrankisch, anyone), knowing that the lower alcohol and food-friendly characteristics of Austrian wine make it a great match for a variety of cuisines - Eastern European to asian, and everything in between. And if you have a hankering for some hard-to-find Austrian wines, check out the selection at Winemonger.com (my writeup from years ago here). So if you will be in San Francisco on May 3 and would like to attend, use the discount code BLOGAUSTRIA for $5 off the ticket price. Ping me in the comments, on Twitter, or by email (in the Email Me link on the top right near the blog header) if you'd like to meet up - see you there! Wines from France's Languedoc region have consistently impressed me as great values ever since I began exploring them while on vacation several years ago. Most are earthy with a fair bit of ripe fruit flavors throughout (it gets hot in the southwest corner of France near the Spanish border, after all), pair well with rustic, flavorful cuisine, and normally can be had for $8-12. Why so cheap for a bottle that would sell for twice as much with a different region on it's label? The Languedoc region is still re-establishing itself in the mainstream consumer's mind as a place that makes good wine after decades of churning out vats and vats of ultra-cheap plonk that lacked any sort of character. This began to change 10-20 years ago as adventurous winemakers moved in and brought the winemaking techniques up to modern standards - buying these wines now gives you the benefit of their expertise without having to pay through the nose for it (yet ...). The 2006 Chateau Lamy Corbieres doesn't disappoint. It is 35% Carignan, 35% Grenache, 15% Syrah and 15% Mourvedre and has a musty and earthy nose, with some blueberry and spice on the palate. It is dry throughout - definitely not a sweet fruit bomb - and would pair well with grilled meat, pizza, hard cheeses or even a red or yellow curry dish that isn't blisteringly spicy. I was recently invited to a tasting in San Francisco with Bernard Hickin and Philip Laffer, the winemakers for Australia's Jacob's Creek vineyards. The tasting covered several of their recent releases and really demonstrated the breadth of the Jacob's Creek line - all too often in the US, "Aussie" and "shiraz" are mashed together as one word, so it was a real joy to explore the diversity of their offerings beyond the usual selections. 2006 Reserve Riesling - tart and full of lime. Winemakers say it will develop honey and butter notes in the bottle. This one seems like a winner with asian cuisine. 2006 Steingarten Riesling - made in limited quantities in good vintages, this one came off like a minerally, flinty, toasty Chablis, with a bit of lemon-citrus flavors as well. Very lovely indeed, and its bone-dry character would pair well with delicate seafood dishes. 2009 (not a typo) Steingarten Riesling - this wine is not yet commercially available and had only been bottled a couple of months ago; made for a great juxtaposition with the previous 2006 version. The color was very light, almost like a vinho verde, and given its youth, intense lime and floral characteristics predominated. Bernard and Philip noted that it would need another 4-6 months to develop the secondary bottle characteristics present in the '06. 2007 Pinot Noir Reserve - slightly spicy and balanced, and at 13% alcohol it was not over-ripe or overblown like so many new-world pinots. Would be a good pairing with duck or salmon. 2004 St. Hugo Cabernet Coonawara - concentrated cassis was the first note, followed by meaty, leafy flavors. This was quite delicious; it was restrained, elegant and mouth-filling, and would pair well with grilled meats. 2006 Reserve Shiraz - flavors of fresh dark plum fruit with a bit of spice and pepper. Recommended to drink over the next 4-5 years as the tannins on the edge continue to soften. This was a very easy-drinking wine - it's pity more Australian winemakers don't make more reasonably-priced shiraz like this. 2005 Centenary Hill Shiraz - this wine had a vibrancy to it and pleasant plum-and-holiday-cake spice on the finish, without any overly jammy flavors. The Barossa Valley vineyards that produce the grapes for this wine have a minimum of 40-year old vines, with the core vines in the 90-95 year-old range. Many thanks to Bernard and Philip for their time and great wines - looking forward to picking up a few of these to go with autumn game dishes! 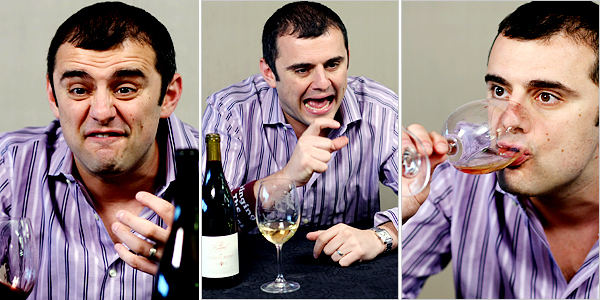 Glad to see the NY Times picked up on Wine Library TV and its irrepressible host, Gary Vaynerchuk. I've been a fan of his for some time; I find his dry wit quite funny, and I am all for anything that de-mystifies wine and brings it to the masses - Gary does this in spades. Plus, he's a Jet fan (my hometown team). If you haven't checked out an episode of Wine Library TV, take a look at the most recent one where he interviews Nick Goldschmidt - hard to imagine another host engaging in the mildly frenetic banter he does with his guest in the first 5 minutes alone. Back to blogging now after being away for a while on business. We had the pleasure of going down to Carmel Valley this past weekend for some good food and wine -- on the food front, we are big fans of both Casanova restaurant (in Carmel-by-the-sea) and their more casual sister bistro in Carmel Valley, the Corkscrew Cafe. As far as wine goes, we decided to stay within the "culinary family" and visit Georis Winery, which is owned by the same folks who own the two restaurants above and is well-known for its excellent merlot (as an added benefit, the tasting room is right next door -- literally -- to the Corkscrew Cafe). Georis puts on an excellent tasting experience in their beautiful outdoor patio, and each tasting is accompanied by a plate of 3 cheeses and a helpful history of the wine from the friendly staff -- highly recommended if you are in the area. We tried several wines, all of which were quite tasty but the stars were the 2000 and 2002 "Estate" Merlot bottlings. Unlike some of the others, these were neither too thin (the 2002 Le Sanglier suffered a bit from this) nor too tannic at this age (the 2001 "Estate" Merlot was a bit tough relative to the other two) -- instead, the 2000 and 2002 were complex, well-balanced and showed a pleasant, lingering finish that paired quite well with both the hard and soft cheeses. These would be great food wines, and the 2000 comes from a renowned vintage that local aficionados believe can be cellared until the 2020's -- since it is so delicious right now, I'm not sure any bottle I bought would last that long. Bottom line: both the wine and the experience at Georis are highly recommended, along with the Corkscrew Cafe next door. This past Saturday we were honored to be invited to the Conrado Cellars 2005 bottling party courtesy of our friends Russ (center) and Susan Perry. Head winemaker Paul Conrado (right) also operates The Conrado Company, a homebuilder specializing in the construction and remodeling of luxury custom homes in the foothills of Silicon Valley -- as a service to his clients, he also (astutely) plants and helps with the operations of nearly a dozen vineyards on their properties, for which he receives half their fruit as payment in exchange for bottling their wine. It works out nicely for all concerned. Saturday morning, 9am: 145 eager friends and family assemble to begin the process of bottling 96 cases of wine (zinfandel and carignane). Washing and drying the bottles -- very important to the end product. Corking each bottle. How long until Paul goes to screwtops? Wait a minute ... I thought they only poured one glass for "quality control"? Sealing each masterpiece with the distinctive foil wrapper. In the end, another award-winning effort for the Conrado team. Great fun all around, we look forward to the next one! Visiting Santa Barbara for the weekend, we came across this gem: L'Ombretta, a Venetian-style wine bar at the corner of Chapala and Anapamu. The website still has a ways to go, but Venetian native Andrea and his wife (co-owners) run a great operation -- 100-200 wines by the glass, with selections that change weekly, and a six-page menu that features regional Italian cuisine ranging from small plates, smoked meats and cheeses to larger plates, all highlighting the distinct food and wine pairing typical of Venice. Two important caveats, though -- the wine list is heavily weighted to the Veneto region (so don't be embarassed if you don't recognize a lot of the names) and the food menu titles are all written in Venetian dialect (so the words are a bit closer to French and Spanish than to traditional Italian ... but the English translations are right underneath, albeit in small font).